The train was to leave Berlin appallingly early. Having confused the German words for Saturday and Sunday in sleepy delirium, I missed the bus to the station. Sitting against a wall on the deserted street corner, my skin blooming with hives, I breathed deeply, clutching the fingers of my left hand in time with each round. The next bus was 14 minutes away, and there were two euros in my pocket – enough for späti coffee and a backhaus croissant. My skin prickled as I waited. For a fortnight, I had been vocally excited about crossing a section of Germany by rail; about seeing how the country outside Berlin rolled and dipped and stretched, with the sun climbing steadily above it. Having made my train with seconds to spare, I slept from the first minute to the last. I arrived in Hamburg aggravated, and with a headache. My premonitions for the weekend away became yet more negative. I had been living in Germany for six months, but this trip, at this time, was potentially treacherous; a practice run for moving away from Berlin for good. As I lurched under the headache and tried to ignore the wheals blossoming on my arms, an enormous inverted blue arch signifying the U Bahn – the underground transport system I had assumed was unique to Berlin – came into view. I felt comforted by the previously alien symbol and realised I was already homesick for a place I was soon going to leave. In the age of unparalleled connectivity and information, the bubbles in which we exist keep us from floating off into dark, uncharted space – and Berlin is the most beautiful, porous, salubrious and tenacious one there ever was. But its base level of acceptance, and celebration of otherness, is a dangerous thing to get used to; it has only ever represented Germany on paper, as inhabitants are quick to acknowledge. Germany outside Berlin is a different beast; wealthier, more conservative and, in places, deeply nationalistic. Then there’s Hamburg, nestled in the crook of the North sea, curling down into mainland Europe; a city with an indeterminate modern identity, famed for fish, trade and pointedly seedy nightlife. I felt in my core that I was compromising my bubble by introducing myself to swathes of the rest of Germany that I didn’t want to witness at this crucial moment. And I was right; in the city’s tourist trenches and pristine new-build establishments, I found proof that Berlin, which had allowed me fleetingly to call it home, was a paradise besieged, scorned by much of the rest of the country for its impunity and struggling to retain its balance. My path through Hamburg took me along the murky water, bustling with fishing vessels, tourist-laden boats and colourful fleets of kayaks; past the gorgeous, impossibly symmetrical red-brick warehouse complex; under the rows of towering metallic buildings dropped like shards between older, more human structures. Sentient suits flitted like midges over the Elbe in-between, and into poster areas for gentrification. 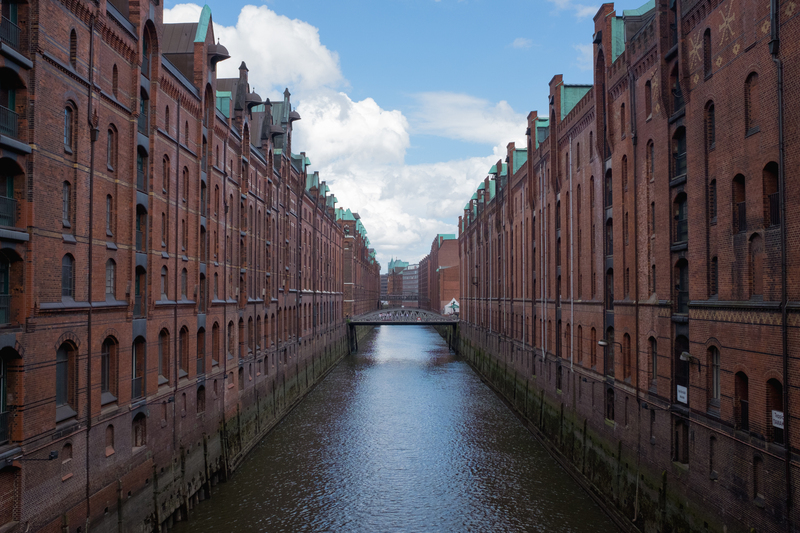 Walking through this Hamburg will take you past white stone, fountains, promenades and arcades surrounded by stretches of water on all sides, broken up by rows of trees hiding bars and cafes. I was encouraged to eat what the supposed locals eat, socialise where the supposed locals socialise (but find mostly sightseers), marvel at the red lights and sleazy cocktail bars of the Reeperbahn and explore the city’s fledgling independent food scene. And it appeared all the city’s young people were here – amid the food trucks and burger restaurants and craft beer stalls. It was a bombastic but welcoming scene, which would itself admit to having little new to say just yet. It was still testing the waters, taking the new-food formula of Hackney or Brooklyn or even Kreuzberg and applying it to districts that couldn’t quite decide if they wanted to push tradition or modernity. However, locals spoke of Hamburg as not only the most beautiful place in Germany, but a truer immigrant city than Berlin due to its proximity to the seas. If the latter was true, it was certainly not obvious outside the explicitly Portuguese Quarter. Beauty was there, though; water and greenery will do that. But the affluence that often overpowered it all was ugly, and I wasn’t used to it after months in a city constantly scraping its cents together. Yet joy was soon to come from realising that Hamburg is, in fact, as important a city as Berlin for its own alternative communities, even if they don’t exist on the surface in the same way. The city’s modern revolutionary foundations, and ongoing struggle for retention of identity against development, were not forthcoming to a visitor – why would they be, when these things manifest themselves in unpredictable ways that can’t be safely recommended by a brochure? Stumble even briefly from the coloured-in parts of the map, however, and you’ll hit what can’t be hidden: long, fume-filled roads, peppered with dwindling shops and garages, separated by industrial stretches of concrete. But these are residential areas, too, and they separate polished Hamburg from the areas which have played so important a part in the city’s burgeoning creative movements; serene streets daubed with graffiti, apartment blocks brightened by painted doors and wrought-iron balconies overflowing with plants. Among the edgy bars and restaurants, this is where community exists; where refugee shelters are quietly run, community gardens thrive and alternative culture is allowed to breathe. And I should have guessed this stuff existed here, if less prominently than in Berlin, as soon as I first met with whispers of Hamburg’s radical history. These came from a middle-aged German woman running a respectable restaurant, who spoke more about taking part in endless anti-development demonstrations in the late 1980s than she did her own food. The restaurant was her ongoing protest, having been wrangled decades ago, a rotting shell saved from the clutches of developers, and turned by her into something she felt belonged in the Hamburg in which she wanted to live. Those she called her comrades had done the same thing with buildings at similar points of collapse, turning them into open studios and galleries, together forming an unofficial collective, keeping independence alive. It would be easy to imagine that these few ex-revolutionaries were Hamburg’s last remaining crusaders, but as I walked, I spotted flashes of truly alternative culture, always on the periphery, and often surrounded by pointedly distressed restaurants, and apartments on the brink of unaffordability. And after countless wrong turns in the Schanzenviertel, I uncovered the epicentre of Hamburg’s underbelly, the Rote Flora: a magnificent, decrepit ex-theatre, listed as “permanently closed” on Google, which has been squatted since the tail-end of the 1980s following protests about its development. The Rote Flora is unique. It has become, over the course of its endlessly threatened life, the heart of radical Hamburg; an increasingly political subject for the city as it continues to provide safe space, a forum for the left and a venue for exhibitions, concerts and dance nights. This autonomous organisation has been threatened for 27 years, and for 27 years – through riots, political ultimatums, and even sales of the building – it has held its ground. It may be less prominent than squats such as Riager Straße 94 in Berlin, or the global Occupy movements, but the Rote Flora could arguably be the most socially important building in Hamburg, and one of the most admirable centres of radical culture in Germany. Significance emanated from its dilapidated walls as I walked through its garden, which had become a public park with an open climbing wall and cavernous skatepark. I looked up to see the words QUEER FLORA emblazoned on a banner overhanging the fenced-off street entrance, advertising an upcoming soli-party to the Sunday brunch-goers wandering up and down the Schulterblatt and I felt buoyed. What I’d found wasn’t quite a lily among thorns, but more the defiant thorn among lilies that “counterculture” is. It may mean third-wave cafes and pale ales in major cities, but in outlying parts of the world – be it wealthy pockets of mainland Europe, or one-horsers in the Bible Belt – it’s still uncomfortable, and all the more essential for it. And it’s always there; no society is without marginalised communities (least of all the wealthier ones). I slipped back into my bubble, gratified by the knowledge that while beautiful cities may push affluence and tourism for posterity, the true foundations of European culture continue to lie in protest.